For years, shaving soap was the standard before the introduction of shaving creams. However, shaving soap is just as effective as shaving cream. When it comes to the bottom line, shaving soaps last longer. When you calculate the cost per is shave it quickly becomes clear that shaving soap the cheaper alternative to shaving cream. So, what do you think is the best shaving soap? Vote for you favorite brand below or add your own review at the bottom of the page. Today quality soaps contain either vegetable fat or tallow and glycerin. The glycerin helps lock moisture into the skin and also acts as an emollient, softening the beard and skin. The fat within the soap acts as the lubricant and adds a layer of protection as you shave. Lubrication is vital for a successful shave, for it allows the blade to glide across the skin smoothly rather than pulling, creating friction and irritation. Soaps with a higher fat content are preferable. Soaps with a low fat count may simply be cheap shower soaps disguised. Regular bath and shower soaps lack the fat content and moisturizing qualities presented in genuine shaving soaps. When shopping for your shaving soap look for the phrase triple-milled on the package. Soap that has been triple milled produces a richer lather and helps leave the skin moisturized and smooth. 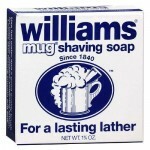 Williams Mug shaving soap (check price) is an inexpensive shaving soap that still provides a quality milled soap and plenty of lather. It is highly recommended for those new to shaving or shaving soaps. Henry Cavendish Luxury Lather Shave Soap (check price) is known for its rich lather. Unlike many shaving creams, the lather from this shave soap is long lasting and does not dry out quickly. The soap is also extremely moisturizing due to the inclusion of Shea Butter. The size of this soap is larger than most on the market and will easily last you three to six months. 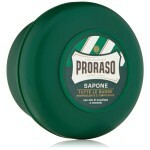 Proraso shaving soap (check price), originating in Italy, is quite popular. It features Eucalyptus and Menthol to create a pleasant cooling sensation. With its natural-based formulations, botanical extracts, and natural oils it provides the perfect coverage for a pleasant shave. 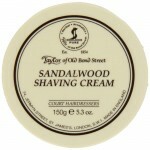 The Taylor of Old Bond Street shaving soap (check price) is well known for its rich scent provided by the sandalwood, cedar, lavender, rosemary, and jasmine ingredients. It comes with a sandalwood shaving bowl, an added plus. Shaving soap offers the classic way to create a great lather. It adds a pleasant routine to the day and has many benefits. Did you know the oldest soap recipe in the world originated over 5,000 years ago with the Sumerians? Back in the day, the soap was created from oils, fats, ashes, and alkalis.